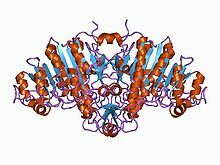 Alkaline phosphatase (ALP, ALKP, ALPase, Alk Phos) (EC 3.1.3.1) or basic phosphatase is a homodimeric protein enzyme of 86 kilodaltons. Each monomer contains five cysteine residues, two zinc atoms, and one magnesium atom crucial to its catalytic function, and it is optimally active at alkaline pH environments. As its name indicates, ALP functions best under alkaline pH environments and has the physiological role of dephosphorylating compounds. The enzyme is found across a multitude of organisms, prokaryotes and eukaryotes alike, with the same general function but in different structural forms suitable to the environment they function in. Alkaline phosphatase is found in the periplasmic space of E. Coli Bacteria. 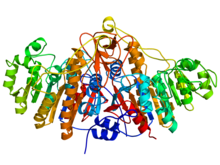 This enzyme is heat stable and has its maximum activity at high pH. In humans, it is found in many forms depending on its origin within the body – it plays an integral role in metabolism within the liver and development within the skeleton. Due to its widespread prevalence in these areas, its concentration in the bloodstream is used by diagnosticians as a biomarker in helping determine diagnoses such as hepatitis or osteomalacia. The level of alkaline phosphatase in the blood is checked through the ALP test, which is often part of routine blood tests. The levels of this enzyme in the blood depend on factors such as age, gender, blood type. Blood levels of alkaline phosphatase also increase two to four times during pregnancy. This is a result of additional alkaline phosphatase produced by the placenta. Additionally, abnormal levels of alkaline phosphatase in the blood could indicate issues relating to the liver, gall bladder or bones. Kidney tumors, infections as well as malnutrition has also shown abnormal level of alkaline phosphatase in blood. Alkaline phosphatase levels in a cell can be measured through a process called "The scoring method". "The scoring method" is a technique used where a sample of the enzyme is extracted from the inside of different individual's blood cells and is analyzed and compared for different enzyme activity. A blood smear is usually taken and undergoes differential centrifugation to isolate Leukocytes and staining to categorize each leukocyte into specific “leukocyte alkaline phosphatase indices.” This marker is designed to distinguish leukocytes and determine different enzyme activity from each sample's extent of staining. Alkaline phosphatase in E. coli is located in the periplasmic space and can thus be released using techniques that weaken the cell wall and release the protein. Due to the location of the enzyme, and the protein layout of the enzyme, the enzyme is in solution with a smaller amount of proteins than there are in another portion of the cell. The proteins' heat stability can also be taken advantage of when isolating this enzyme (through heat denaturation). In addition, alkaline phosphatase can be assayed using p-Nitrophenyl phosphate. A reaction where alkaline phosphatase desphosphorylates the non-specific substrate, p-Nitrophenyl phosphate in order to produce p-Nitrophenol(PNP) and inorganic phosphate. PNP's yellow color, and its λmax at 410 allows spectrophotometry to determine important information about enzymatic activity. Some complexities of bacterial regulation and metabolism suggest that other, more subtle, purposes for the enzyme may also play a role for the cell. In the laboratory, however, mutant Escherichia coli lacking alkaline phosphatase survive quite well, as do mutants unable to shut off alkaline phosphatase production. Intestinal alkaline phosphatase is secreted by enterocytes, and seems to play a pivotal role in intestinal homeostasis and protection as well as in mediation of inflammation via repression of the downstream Toll-like receptor (TLR)-4-dependent and MyD88-dependent inflammatory cascade. It dephosphorylates toxic/inflammatory microbial ligands like lipopolysaccharides, unmethylated cytosine-guanine dinucleotides, flagellin, and extracellular nucleotides such as uridine diphosphate or ATP. Thus, altered IAP expression has been implicated in chronic inflammatory diseases such as IBD. It also seems to regulate lipid absorption and bicarbonate secretion in the duodenal mucosa, which regulates the surface pH. Studies show that the alkaline phosphatase protein found in cancer cells has similar characteristics to that found in non-malignant body tissues and that the protein originates from the same gene in both the malignant and the non-malignant cells. One study tested the structural comparison between the alkaline phosphatase proteins found in liver giant-cell carcinoma and non-malignant placental cells. In this study, an alkaline phosphatase that was immunochemically similar to placental alkaline phosphatase was purified from metastases of giant-cell carcinoma of the lung and its physical and chemical properties were determined. Thereafter, these were compared with purified placental alkaline phosphatase. The results showed great similarity in both based on evaluations of NH2-terminal sequence, peptide map, subunit molecular weight, and isoelectronic point. Overall, this study strongly supports the supposition that the alkaline phosphatase protein in both tumor and non-malignant placental cells are derived from the same gene. ^ Tamás L, Huttová J, Mistrk I, Kogan G (2002). "Eﬀect of Carboxymethyl Chitin-Glucan on the Activity of Some Hydrolytic Enzymes in Maize Plants" (PDF). Chem. Pap. 56 (5): 326–329. ^ a b c Millán JL (June 2006). "Alkaline Phosphatases : Structure, substrate specificity and functional relatedness to other members of a large superfamily of enzymes". Purinergic Signalling. 2 (2): 335–41. doi:10.1007/s11302-005-5435-6. PMC 2254479  . PMID 18404473. ^ Dhruv L, Savio J (22 October 2017). "Alkaline Phosphatase". ^ Sharma U, Pal D, Prasad R (July 2014). "Alkaline phosphatase: an overview". Indian Journal of Clinical Biochemistry. 29 (3): 269–78. doi:10.1007/s12291-013-0408-y. PMC 4062654  . PMID 24966474. ^ Willsky GR, Bennett RL, Malamy MH (February 1973). "Inorganic phosphate transport in Escherichia coli: involvement of two genes which play a role in alkaline phosphatase regulation". Journal of Bacteriology. 113 (2): 529–39. PMC 285262  . PMID 4570598. ^ Wanner BL, Latterell P (October 1980). "Mutants affected in alkaline phosphatase, expression: evidence for multiple positive regulators of the phosphate regulon in Escherichia coli". Genetics. 96 (2): 353–66. PMC 1214304  . PMID 7021308. ^ Maxam AM, Gilbert W (1980). "Sequencing end-labeled DNA with base-specific chemical cleavages". Methods in Enzymology. Methods in Enzymology. 65 (1): 499–560. doi:10.1016/S0076-6879(80)65059-9. ISBN 978-0-12-181965-1. PMID 6246368. ^ Birkett DJ, Done J, Neale FC, Posen S (1966-01-01). "Serum Alkaline Phosphatase In Pregnancy: An Immunological Study". The British Medical Journal. 1 (5497): 1210–1212. doi:10.1136/bmj.1.5497.1210. JSTOR 25407775. ^ Benham FJ, Harris H (August 1979). "Human cell lines expressing intestinal alkaline phosphatase". Proceedings of the National Academy of Sciences of the United States of America. 76 (8): 4016–9. doi:10.1073/pnas.76.8.4016. JSTOR 69758. PMC 383967  . PMID 291061. ^ Hua JC, Berger J, Pan YC, Hulmes JD, Udenfriend S (April 1986). "Partial sequencing of human adult, human fetal, and bovine intestinal alkaline phosphatases: comparison with the human placental and liver isozymes". Proceedings of the National Academy of Sciences of the United States of America. 83 (8): 2368–72. doi:10.1073/pnas.83.8.2368. JSTOR 27284. PMC 323298  . PMID 3458202. ^ Badve SV, Zhang L, Coombes JS, Pascoe EM, Cass A, Clarke P, Ferrari P, McDonald SP, Morrish AT, Pedagogos E, Perkovic V, Reidlinger D, Scaria A, Walker R, Vergara LA, Hawley CM, Johnson DW (2015). "Association between serum alkaline phosphatase and primary resistance to erythropoiesis stimulating agents in chronic kidney disease: a secondary analysis of the HERO trial". Canadian Journal of Kidney Health and Disease. 2: 33. doi:10.1186/s40697-015-0066-5. PMC 4538753  . PMID 26284153. ^ Mizumori M, Ham M, Guth PH, Engel E, Kaunitz JD, Akiba Y (July 2009). "Intestinal alkaline phosphatase regulates protective surface microclimate pH in rat duodenum". The Journal of Physiology. 587 (Pt 14): 3651–63. doi:10.1113/jphysiol.2009.172270. PMC 2742288  . PMID 19451200. ^ Wang W, Chen SW, Zhu J, Zuo S, Ma YY, Chen ZY, Zhang JL, Chen GW, Liu YC, Wang PY (2015). "Intestinal alkaline phosphatase inhibits the translocation of bacteria of gut-origin in mice with peritonitis: mechanism of action". PLOS One. 10 (5): e0124835. doi:10.1371/journal.pone.0124835. PMC 4422672  . PMID 25946026. ^ Sharma U, Pal D, Prasad R (July 2014). "Alkaline phosphatase: an overview". Indian Journal of Clinical Biochemistry : IJCB. 29 (3): 269–78. doi:10.1007/s12291-013-0408-y. PMC 4062654  . PMID 24966474. ^ Alam SN, Yammine H, Moaven O, Ahmed R, Moss AK, Biswas B, Muhammad N, Biswas R, Raychowdhury A, Kaliannan K, Ghosh S, Ray M, Hamarneh SR, Barua S, Malo NS, Bhan AK, Malo MS, Hodin RA (April 2014). "Intestinal alkaline phosphatase prevents antibiotic-induced susceptibility to enteric pathogens". Annals of Surgery. 259 (4): 715–22. doi:10.1097/sla.0b013e31828fae14. PMC 3855644  . PMID 23598380. ^ Ghosh SS, Gehr TW, Ghosh S (December 2014). "Curcumin and chronic kidney disease (CKD): major mode of action through stimulating endogenous intestinal alkaline phosphatase". Molecules. 19 (12): 20139–56. doi:10.3390/molecules191220139. PMID 25474287. ^ Bilski J, Mazur-Bialy A, Wojcik D, Zahradnik-Bilska J, Brzozowski B, Magierowski M, Mach T, Magierowska K, Brzozowski T (2017). "The Role of Intestinal Alkaline Phosphatase in Inflammatory Disorders of Gastrointestinal Tract". Mediators of Inflammation. 2017: 9074601. doi:10.1155/2017/9074601. PMC 5339520  . PMID 28316376. ^ Molnár K, Vannay A, Szebeni B, Bánki NF, Sziksz E, Cseh A, Győrffy H, Lakatos PL, Papp M, Arató A, Veres G (July 2012). "Intestinal alkaline phosphatase in the colonic mucosa of children with inflammatory bowel disease". World Journal of Gastroenterology. 18 (25): 3254–9. doi:10.3748/wjg.v18.i25.3254 (inactive 2018-06-14). PMC 3391762  . PMID 22783049. ^ Narisawa S, Huang L, Iwasaki A, Hasegawa H, Alpers DH, Millán JL (November 2003). "Accelerated fat absorption in intestinal alkaline phosphatase knockout mice". Molecular and Cellular Biology. 23 (21): 7525–30. doi:10.1128/mcb.23.21.7525-7530.2003. PMC 207564  . PMID 14560000. ^ Greene PJ, Sussman HH (October 1973). "Structural comparison of ectopic and normal placental alkaline phosphatase". Proceedings of the National Academy of Sciences of the United States of America. 70 (10): 2936–40. doi:10.1073/pnas.70.10.2936. JSTOR 63137. PMC 427142  . PMID 4517947. ^ Vroon D. "Clinical Methods: The History, Physical, and Laboratory Examinations. 3rd edition". ^ Robinson D, Sandblom G, Johansson R, Garmo H, Stattin P, Mommsen S, Varenhorst E (January 2008). "Prediction of survival of metastatic prostate cancer based on early serial measurements of prostate specific antigen and alkaline phosphatase". The Journal of Urology. 179 (1): 117–22; discussion 122–3. doi:10.1016/j.juro.2007.08.132. PMID 17997442. ^ O'Brien PJ, Herschlag D (May 2001). "Functional interrelationships in the alkaline phosphatase superfamily: phosphodiesterase activity of Escherichia coli alkaline phosphatase". Biochemistry. 40 (19): 5691–9. doi:10.1021/bi0028892. PMID 11341834. This entry represents alkaline phosphatases (EC) (ALP), which act as non-specific phosphomonoesterases to hydrolyse phosphate esters, optimally at high pH. The reaction mechanism involves the attack of a serine alkoxide on a phosphorus of the substrate to form a transient covalent enzyme-phosphate complex, followed by the hydrolysis of the serine phosphate. Alkaline phosphatases are found in all kingdoms of life, with the exception of some plants. Alkaline phosphatases are metalloenzymes that exist as a dimer, each monomer binding metal ions. The metal ions they carry can differ, although zinc and magnesium are the most common. For example, Escherichia coli alkaline phosphatase (encoded by phoA) requires the presence of two zinc ions bound at the M1 and M2 metal sites, and one magnesium ion bound at the M3 site [PUBMED:15938627]. However, alkaline phosphatases from Thermotoga maritima and Bacillus subtilis require cobalt for maximal activity [PUBMED:11910033]. In mammals, there are four alkaline phosphatase isozymes: placental, placental-like (germ cell), intestinal and tissue-nonspecific (liver/bone/kidney). All four isozymes are anchored to the outer surface of the plasma membrane by a covalently attached glycosylphosphatidylinositol (GPI) anchor [PUBMED:17520090]. Human alkaline phosphatases have four metal binding sites: two for zinc, one for magnesium, and one for calcium ion. Placental alkaline phosphatase (ALPP or PLAP) is highly polymorphic, with at least three common alleles [PUBMED:11124260]. Its activity is down-regulated by a number of effectors such as l-phenylalanine, 5'-AMP, and by p-nitrophenyl-phosphonate (PNPPate) [PUBMED:15946677]. The placental-like isozyme (ALPPL or PLAP-like) is elevated in germ cell tumours. The intestinal isozyme (ALPI or IAP) has the ability to detoxify lipopolysaccharide and prevent bacterial invasion across the gut mucosal barrier [PUBMED:18292227]. The tissue-nonspecific isozyme (ALPL) is, and may play a role in skeletal mineralisation. Defects in ALPL are a cause of hypophosphatasia, including infantile-type (OMIM:241500), childhood-type (OMIM:241510) and adult-type (OMIM:146300). Hhypophosphatasia is an inherited metabolic bone disease characterised by defective skeletal mineralisation [PUBMED:17719863]. This entry also contains the related enzyme streptomycin-6-phosphate phosphatase (EC) (encoded by strK) from Streptomyces species. This enzyme is involved in the synthesis of the antibiotic streptomycin, specifically cleaving both streptomycin-6-phosphate and, more slowly, streptomycin-3-phosphate [PUBMED:1654502]. For those sequences which have a structure in the Protein DataBank, we use the mapping between UniProt, PDB and Pfam coordinate systems from the PDBe group, to allow us to map Pfam domains onto UniProt sequences and three-dimensional protein structures. The table below shows the structures on which the Alk_phosphatase domain has been found. There are 236 instances of this domain found in the PDB. Note that there may be multiple copies of the domain in a single PDB structure, since many structures contain multiple copies of the same protein sequence.